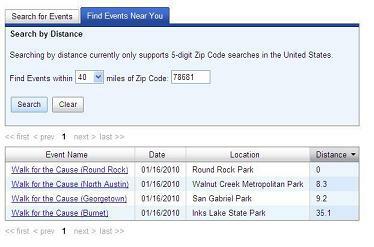 This example demonstrates using the TeamRaiser event search APIs to locate a TeamRaiser event. It also demonstrates how AJAX libraries and Convio API code can interact. TeamRaiser event search APIs allow users to search for events by specifying information about the event, or to search for events by distance from a given zip code. The Event Search form uses YUI tabbed navigation to present either the "Search by Information" or "Search by Distance" forms. Convio provides this download as a courtesy and in the hope that it will be useful. This download references or utilizes Convio Open APIs. This download is subject to the terms of the Convio API and Web Services License Agreement.